Palm Springs, California is known for a lot of things, but nothing more famously than its high-desert heat that has made it the go-to destination for generations of retirees and “snowbirds” from the frigid Midwest. Often, though, that heat can reach unbearable heights, sending everyone scurrying for air-conditioned shelter. Ironically, one of the most unique ways to beat the heat in Palm Springs is actually to head out into the desert — to a fascinating Native American preserve called Indian Canyons. 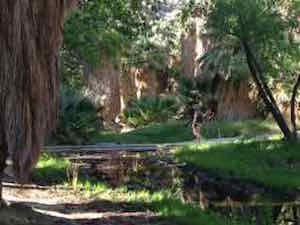 The Indian Canyons Tribal Park is barely a 15-minute drive from downtown Palm Springs, at the southern terminus of Palm Canyon Road. On a recent visit, my wife and I, unaware of what we were about to experience, were all geared up for a day hike in the sizzling desert as we passed through the park tollbooth and proceeded up a winding, three-mile road to our destination: Palm Canyon, one of three canyons preserved in the park. True to our expectations, the road ended in a treeless dirt parking lot that served a ranger station, a trading post/snack bar, and several covered picnic areas. The place literally shimmered with the 90-plus-degree heat. We lathered on the sunscreen, bought a hat for my wife at the trading post, slung on our Camelback daypacks, and off to the trailhead we went — and there gasped in utter amazement. At the bottom of a short, steep, switch-backing trail was no dry-as-dust canyon bottom, but rather a thick grove of palm trees and a quiet blue pond that looked like a tropical island that had been somehow misplaced in the surrounding desolation. With each step down, the air seemed to lose a degree or two until, when we’d finally reached the bottom, it must have been 15 degrees cooler than where we’d been just three minutes before! Sitting there eating lunch, we marveled at our surroundings: still waters, lush green undergrowth, and countless tall palm trees that formed our shady canopy. 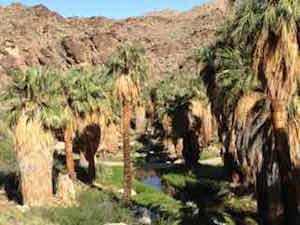 Palm Canyon really was a canyon of palm trees — right in the middle of the desert! Upon finishing, we set out on the Palm Canyon Trail, a moderate two-mile loop that alternately plunged us into dark “jungle” or led us to the fringes of the desert, depending on how close we were to the canyon floor’s spring-fed stream. Never, though, were we more than a few steps from the cooling shade of the palms, some young, thick, and close to the ground with huge fan-like fronds, others towering majestically above and forming long, columned avenues through which the trail traversed. At the trail’s turnaround point, we decided to briefly deviate and venture up one of the numerous side trails that scaled the canyon’s walls. The desert heat returned in seconds, and though the views were impressive, we didn’t linger long. The cool shade of that misplaced tropical paradise had us hooked. Upon returning to the trading post, we had a pleasant chat with the park’s ranger while sucking on Fudgsicles (only $1 apiece). 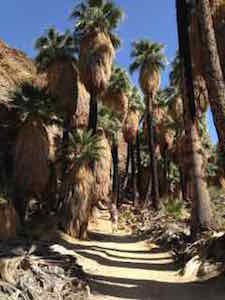 Such hidden groves of California palms, the only palm tree native to western North America, have been home to the Agua Caliente band of the Cahuilla Indians for centuries, he told us, nurtured by water seeping up through earthquake faults. The park itself had been created in 1929 in order to preserve them and share them with visitors, who average around 100,000 each year. Hopefully you’ll be one of them if you’re ever in Palm Springs. It’s definitely the coolest place to be on a hot desert afternoon.